Professional studio quality: Record individual tracks, entire albums or voice-overs quickly and easily. Transfer your albums, singles and EPs to your computer. Title information and CD covers are automatically retrieved for original CDs. New, more efficient algorithm: Import video files and start editing the audio track right away. The various frequencies of the audio track can be visualized. This allows for precise removal specific noises. When you select a range in the spectral display, you can preview to hear what the range sounds like after cleaning and compare it to the original. This feature makes suggestions for improving audio based on an analysis of your audio signal. Any suggested improvements can be adjusted. Helpful presets: Easily remove unwanted sounds like noise, or traffic noise with the help of over 360 presets. The program offers direct access to all effect parameters for sound optimization in audio editing and mastering. Crackling can be quickly and easily removed from vinyl with presets for different strength levels. Prevent clipping during recording or remove it in post production with the help of the limiter and DeClipper to account for varying levels of volume. Access diverse presets for optimizing audio recordings made with your smartphone for enhanced results. Eliminate wind noise in no time at all using professional plug-ins and presets. Get rid of noises from older camcorder models by using simple presets or your own customized adjustments. Optimize the sound of speech with a few clicks and remove popping and hissing "s" sounds in voice recordings. Create transitions and add audio commentary or sound effects to recordings. The 8 tracks provide plenty of space for comprehensive audio editing. Access one of the best algorithms in the world from zplane™ for adjusting pitch and speed. ....and access precise, virtually artifact-free results. Switch to range mode to select individual sections within a track and copy or edit them with a single click. Edit individual sections of a recording with different effects and settings to specifically remove noises, for instance. Explore the numerous audio editing features such as volume adjustments, individual editing techniques and working with automatic wizards. The program automatically detects where one song ends and the next one begins, so you can select and skip the tracks on the finished CD. So können auf einer Audio-CD einzelne Titel angewählt oder übersprungen werden. Fade lines within the audio track enable you to quickly and easily adjust the volume. This lets you slowly fade in intros. High efficiency: Optimize or export multiple songs or entire albums in one step. This lets you edit your entire music archive in one go. Cover and track titles are automatically populated for original CDs and displayed when you play music on smartphones, MP3 players or music management programs. Vinyl or CD, MP3 or OGG, WAV or AIFF: You can record in a range of formats, and burn CDs and convert audio files as well. Enhance speech recordings and reduce background noise, wind noise or sibilants – a wide range of presets are included for removing all types of noise. The preview monitor enables you to work on two monitors simultaneously, including in 4K. The ideal tool for synchronizing picture and sound. Click on your track and the Video Sound Optimizer will suggest the right effect settings for enhancing music or speech in your footage. Convert your video files with optimized sound into all standard formats. Movie formats such as MPEG-4 can easily be converted to WMV. 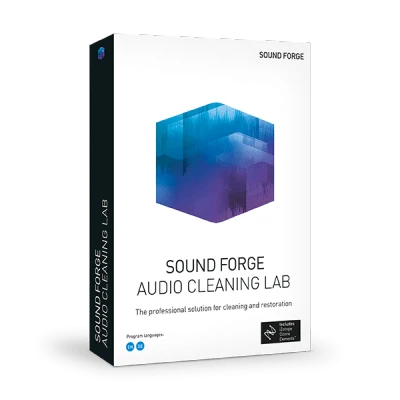 Transfer your audio or video projects with just a few clicks from SOUND FORGE Audio Cleaning Lab to any other video editing software. Simply select the genre for your song and the Auto Mastering function selects the optimal audio settings for optimizing sound. Compare and preview results with other music styles such as jazz, 70s funk & soul or classic 80s pop. Optimize and fine-tune the sound image of your audio material with just a few clicks. The new, parametric 6-band EQ module provides optimal sound for your productions. The StereoFX module expands the width of the stereo field and the MultiMax multiband compressor/limiter produces an authentic, warm sound image. Create different masters in no time with the convenient mastering wizards – like for streaming or radio, for example. Additional plug-ins from MAGIX or third-party providers can be easily integrated using the VST3 interface. essentialFX is a collection of 6 professional effect plug-ins taken directly from the field of professional audio. eFX Reverb contains everything you need for modulating reverb effects professionally - whether for short reflections or longer reverb. This plug-in only acts when the set audio signal occurs, for example, noise caused by two sources. Optimize speech and vocal recordings using the compressor, DeEsser and highpass filter for a maximum level of quality. 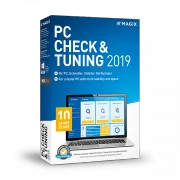 This plug-in simulates the sound of an analog tube amplifier and is ideal for creative distortion in speech recordings in audio books or videos. Play around with sounds: Discover various custom settings for the classic flanger effect. This enables you to create a warmer, more characteristic sound by reducing sibilants and popping in speech and vocal recordings.